In the process of moving existing recipes from ELR I feel are worthy of being included in my ATF portfolio. Huck Yeah I think fits right in with my other formulations. A number of people stated all they could taste in my older formulation of this profile was the berries, So I decided to update with this revision. If you're into creamy, tart and sweet recipes I can recommend this one. 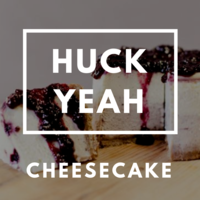 This combination makes up the cheesecake base. Contributes a "cheesy" texture with a little cream cheese filling. Also bestows weight to the mix. Used to add bottom ripeness to the huckleberry with a little texture to the graham. Used to append a fatty jammy depth to the berry while not muddling strawberry notes. Use this sh*t with a light hand. Not kidding. Goes perfume quickly. Less is more with this bad boy. In this revision I felt it was the best level for prominence while meshing with the creamy tart notes. This recipe is the property of SteamOn and released under the CC Attribution-Noncommercial 4.0 license. You may not copy, derive or commercialize this recipe without following the terms of this license or the explicit permission of the creator. I love this stuff. Make it all the time. It’s original and a great cheesecake.